Earlier this week, we linked you to an article about creating your own container gardens. We hope your creative juices are flowing, and that you’ve been able to get a project or two rolling! Here’s another article discussing ways to save water in your new container garden. Whether you have a large yard, or none at all, container gardens are a wonderful way to add some colorful plant life to your home or work space. Check out these fantastic ideas from Sunset.com to get inspired as to how you could make a container garden of your own. Are you looking to create a veggie garden in the Bay Area, but don’t know what to plant? Check out this wonderful book by Pam Peirce called, “Golden Gate Gardening, The Complete Guide to Year-Round Food Gardening in the San Francisco Bay Area & Coastal California”, by Pam Pierce. Pam is a Bay Area garden guru, and has spent years studying the local climate while figuring out just what flourishes best locally. The only advice I can give you, is to have a some fresh soil and some pots ready, because after reading you’ll be inspired to get creative in your own space! Be on the look out for more insights every week on the FYGN blog, and happy gardening! Are you interested in creating a raised veggie garden for your home? Check out this fantastic article from Sunset.com to get all the details on how to go about it! North Bay Climate Zones Native PlantsNo matter where you live, it is always beneficial to introduce Native Plants to your garden. Native Plants evolved in their preferred climate & soil type, and around local animals, so they are most adapted to thrive in their local environment. These plants also need less watering & maintenance, they will attract local wildlife, and need no pesticides. At FYGN, we love Native Plants because they are the easiest for our clients to take care of on a day-to-day basis. Here is a list of 5 of our favorite plants, native to San Francisco, and the Northern Bay Area. Amethyst flowers blossom in vibrant blues, purples, and whites, while growing one to two feet tall. Plant them in your yard or in hanging baskets to add a beautiful touch of color to your green garden, and a smile to your face. The Begonia is another dashingly colorful plant, perfect for pots, hanging, or in your garden bed. They flourish best when potted with rich soil in filtered shade, making them perfect for Bay Area gardens. They will bloom abundantly by hanging them, but the flowers will grow larger by potting them, so you can decide what works best for your home. Despite the name, the Dead Nettle produces pretty flowers and an exuberant green hue guaranteed to liven up any garden. The Dead Nettle grows in many varieties, and some are even edible. Whether you plant it as an accent to your garden, or to consume, the Dead Nettle is a solid choice for your Bay Area home. The Flowering Maple is an evergreen shrub that grows up to 8 feet tall. The dwarf genus of this plant is commonly referred to as “Melon Sorbet”, and will grow 18 to 36 inches in pots. This bell-shaped orange plant is a nice complement to other blue and purple flowers, and is the perfect addition to your garden. The “Electric Lime” coloring of the Heuchera is certainly enough to liven up even the darkest greens of your garden. Heuchera grows up to 28 inches, and is best suited for cooler climates with little sun in the Bay Area. This plant attracts butterflies and hummingbirds, and is sure to brighten your day. FYGN primarily caters to CA Climate Zones 15, 16, & 17. Now, more than ever, we must work together to conserve as much water as we possibly can. Here is a list of 11 simple ways we can work together to conserve water in our homes, and gardens. 1.Wash veggies and fruits in a large bowl or pot. When you’re done, you can use that water in your garden or for your houseplants. 2.If you have a yard, start a compost pile to avoid using your garbage disposal as much as possible. If you have pets, make sure to install a fence to keep them out. 3.Believe it or not, Energy Star rated dishwashers actually use less water than washing your dishes by hand. Load it, set it, and forget it! 4.The average 5-foot bathtub takes about 60 gallons of water to fill. Try taking a short shower instead. 5.The typical home shower streams about 7 gallons per minute. By reducing your shower time by 2 minutes, you will save nearly 420 gallons each month! 6.Bathroom and kitchen water faucets can use up to 3 gallons of water per minute. You can reduce the flow by up to 40% by installing newer aerators on each faucet. 7.Using a toilet tank bank will save up to 0.8 gallons per flush. Simply fill the bag with water and place it in your toilet tank and start saving water immediately! 8.Proper plant maintenance and pruning will aid your plants in drinking more effectively. 9.Place a few ice cubes in your hanging plants to give them a refreshing drink without overflowing them. The typical ice cube is about 1 oz, so the size of the plant should dictate how many cubes to use. 10.Rainwater harvesting is easier than you might think. Use a large barrel placed under your gutters to collect excess rainwater, and pour it over your garden. 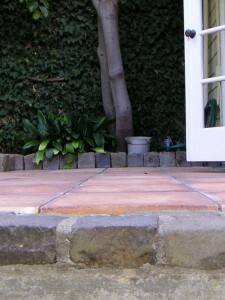 11.Use a broom, instead of the hose, to clean your driveway and patios without wasting water. The average hose uses about 10 gallons per minute! Together, we can save gallons of water each day by following these easy and cost-effective steps. For further tips and tricks, be sure to check the FYGN blog frequently! I visited my brother recently at his home in Oakland, Ca. Unlike me, he inherited the family “Black Thumb” but somehow has managed to pull off one of the most fragrant and explosive Lavender gardens I have seen in the East Bay. I also noticed it writhing with docile bees, so it’s no surprise that everything around his house seemed to be vibrant and blooming. You may want to consider adding a beautiful sweet smelling lavender plot to your landscape to greet your guests, and I’m not just talking bees. These clients were looking for something special for their first home. They wanted to create a warm and natural environment that was easy to maintain. We worked with award-winning designer Geff Geffin to deliver a beautiful garden. That might be what your garden is thinking when they thirst for water or drowned in pooling. A properly maintained irrigation system and drainage are two extremely important factors to keep, happy, healthy and hearty plants. If you can hear your plants growing frustrated with their environment, we are glad to come and play therapist. We are irrigation professionals that can design a proper system, fix problems, and save you money.